Oh. They're fixing the locker numbers. It looks like one has fallen off, all by itself. Which one is it? Update: The day after I typed this post, the guys were out working on the lockers. I walked out, and as I did the one guy threw a tag on the ground and turned around towards me. I said to him, "Hey, if you have an extra 27 could I have it?" He looks at me all funny and says, "That is the one I just threw on the ground." 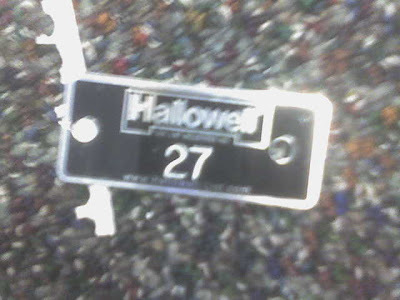 He reaches over, picks it up, and hands it to me with a look that says, "Why did you want a 27?" and "How did you know I just took that one off of a locker?" I remeber this... Well... it is pretty freaky.